HURRY! This Coupon Expires Soon! "Took this to the Galapagos last week and it worked very well. Very comfortable to wear, and didn't have to worry about the mouthpiece becoming detached from the goggles like with traditional snorkel masks. Got rave reviews from local guides and fellow travelers, and many of them noticed that these masks were very popular items being rented down there. Very happy with this mask." - Curtis T.
"Bought these initially for us grown adults, let the kiddos try them and they loved them. So, we bought them for all 5 kids to take to Bermuda for snorkeling. Easy to put on, easy for a first timer or experienced person. Each kiddo has their own bag that the snorkel come with. A must buy for the entire family. For sizing we bought the same for everyone from the 9 year old to us parents. They all fit fine with no leaking." 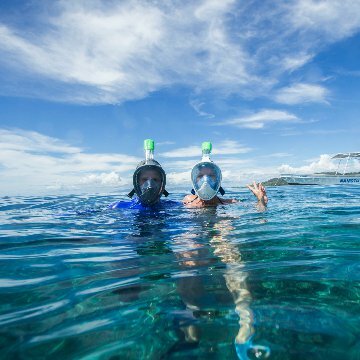 - Brandy P.
What People Are Saying About Easy Snorkel On..
Q: How do I put together/setup my Easy Snorkel mask? Q: What if I have a mustache, beard or other facial hair? Can I use the mask? Will it seal? A: We have not had anyone with facial hair report any issues with using the mask. Carry on our bearded friends! 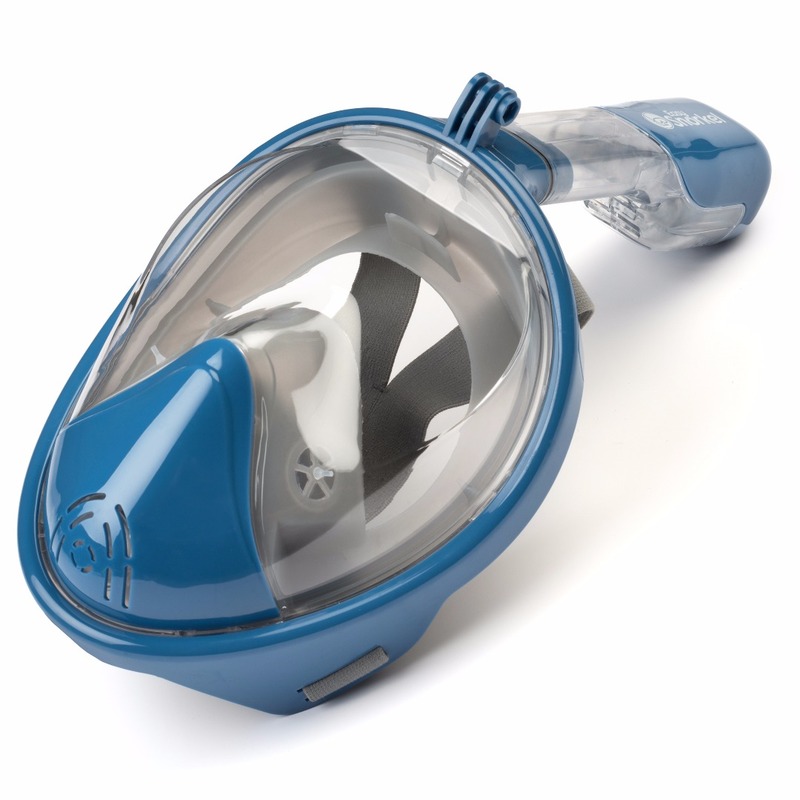 ► Full 180° face design allows user breathe through mouth or nose while snorkeling with no mouthpiece. 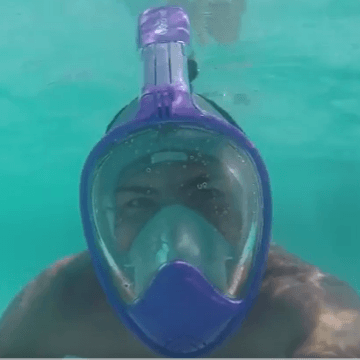 ► Snorkel swimming mask is anti-fog, anti-leak, and gives user a full view of water below. ► Soft, fabric straps ensure snorkeling gear stays on the face and won’t snag hair or skin. 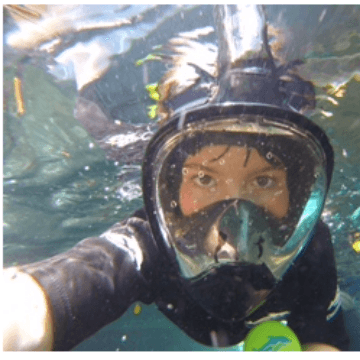 ► Diving mask is easy to use and great for beginners, kids, and experts alike! ► Goggles come in two (2) sizes and a variety of colors to match your other equipment. Q: Can I wear glasses under the mask? Q: How deep can I dive with the mask on? A: That's tough to answer and for liability sake we want to be careful with HOW we answer this question. We have had reports from other Easy Snorkel users of no issues diving a few feet under water. However, the mask is NOT intended for diving. It is a snorkel mask, not a scuba mask. So, dive a your own risk! Q: When I received my mask in the mail, there was a plastic film on it. Do I leave that on or take it off? A: Take it off. That is just to protect the mask during shipping. Q: Can I swim laps in a pool using the mask? A: Yes, you should have no issues swimming laps in the pool as long as the mask is used as instructed. However, we DO NOT recommend diving into the pool head first with the mask on. So, no Olympic starts! YES! Send My Coupon Now!